Arsen Gueleserian first started the art of tailoring at the early age of 12 years old. Upon graduating from the Tailoring Institute of Istanbul, Arsen worked as a custom tailor with some of the finest clothiers in France and Germany. His vision of bringing his old-world craftsmanship to the United States materialized in 1979. Arsen first worked as a head tailor at some of the finest stores in Fashion Island and South Coast Plaza. In 1981, he fulfilled a lifelong dream and opened his tailor shop in Costa Mesa, California. 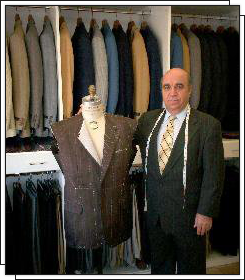 For over 35 years, Arsen's European Tailoring has been in the same location, serving the Orange County community. Our client list includes Hollywood stars, celebrity recording artists, notable sports figures, and prominent social and professional individuals from Orange County. Like them, Arsen can help you look your best when you get dressed.